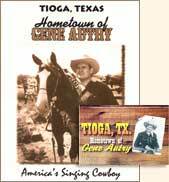 There's only one town that can claim to be the birthplace of Americas Favorite Singing Cowboy, Gene Autry: Tioga, Texas. Founded in 1881, Tioga flourished as a haven for those seeking the healing properties of its famed mineral water. Born September 29, 1907, Gene was raised just outside of Tioga where his grandfather, E.W. Autry, was a Baptist preacher at the Indian Creek church. When Gene was approximately five years old, his grandfather recruited him for the church choir. As a teenager, Gene attended Tioga High School. An ambitious boy, he worked in Sam Andersons barbershop shining shoes and later at the Tioga train depot. It was not uncommon to find Gene singing on the steps of the school, at the barbershop, and at the depot. Gene's Tioga High School yearbook from 1924. At the height of his fame in 1941, Gene returned to Tioga to visit his uncle Cal. He also took time to visit old friends, including Sam Anderson, who trimmed his hair. The town is currently in the process of designating Cal Autrys house a historic landmark. Gene at his aunt and uncle's house, November 1941. Gene gets his hair trimmed by Sam Anderson, November 1941. To celebrate Genes association with Tioga, the first annual Gene Autry Day was held on September 29, 2001. Texas House Resolution No. 575 was adopted April 30, 2001, honoring Gene and Tiogas observance of Gene Autry Day. The annual daylong September festival kicks off the night before with the Gene Autry Festival Ball and Benefit Auction. Program and postcard from Tioga, Texas. On Gene Autry Day, visitors can see musicians, storytellers, and visit many vendors. The festival also serves as a fundraiser for the Tioga Museum and Heritage Association, which seeks to preserve the historical artifacts of Tioga and provide information about the area to the public. 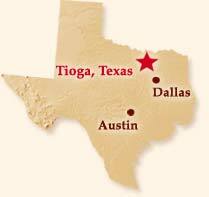 Click here to visit the official Tioga, Texas website. Use the links below for information on the Gene Autry Music Festival in Tioga, Texas.